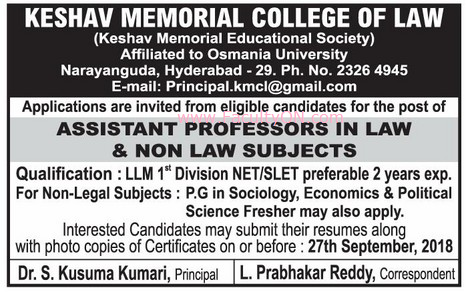 Keshav Memorial College of Law, Hyderabad has advertised in the EENADU newspaper for recruitment of Assistant Professor jobs vacancies. Interested and eligible job aspirants are requested to apply on or before 27th September 2018. Check out further more details below. About College: KMIT, established in year 2007 , is one of the premier engineering colleges in the state of Telangana. KMIT is sponsored by Keshav Memorial Education Society (KMES) ,well known in Hyderabad , for the past 75 years, for running various educational institutions of repute. How to Apply: Interested and eligible candidates are requested to send their updated CV along with copies of certificates and recent passport size photographs to the postal address or email address given below.